Need a gift for a science teacher? 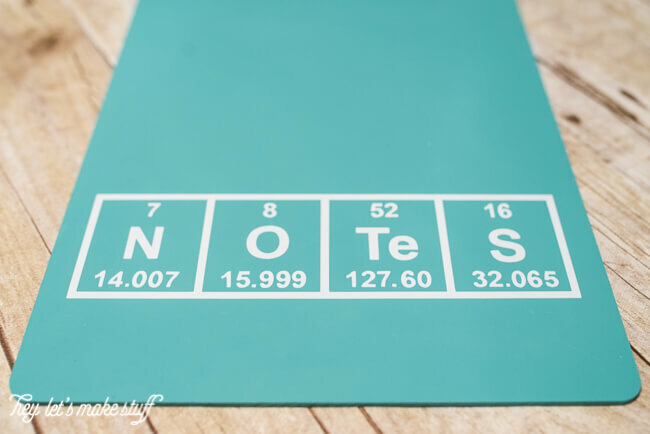 This Periodic Table Clipboard Teacher Appreciation Gift is the perfect gender-neutral teacher gift! I found a $2 clipboard from Target and thought I could do a little DIY to make it a fun, inexpensive clipboard teacher appreciation gift. I wanted it to be gender neutral — teacher’s gifts tend toward the feminine and that didn’t seem fair to me. I also wanted something that worked beyond elementary school. Recently, I saw this adorable nursery idea where the blogger used the Periodic Table of the Elements to spell out the name of the baby on the wall. The idea of using the Periodic Table as an alphabet has stuck with me, and I knew it was perfect for this project. I started by painting the clipboard with some teal chalk paint. You could use whatever color you’d like, of course — I really wish I had some black chalkboard paint! That would have been rad. I like chalk paint for this project because if needed, the teacher could take notes directly on the clipboard. So handy. I just used my steady hand to paint around the clip at the top — this is craft lightning and there’s no time for taping it off! You can always scrape paint off the metal with your fingernail if you need to. Painting the clipboard took two coats and dried quickly — make sure you get the edges as well. I used my trusty Cricut Explore to cut out the file in white vinyl, sized 8″ across, and weeded out the negative-space vinyl. I then needed an easy way to transfer my vinyl to my clipboard — all of those tiny pieces seemed way too difficult to transfer one by one! Thankfully, I had some Cricut Transfer Tape in my stash. I’d never used it before, but thought this was the perfect chance to give it a shot. It worked like a dream! I transferred the vinyl to the transfer tape, and then placed it on my clipboard. Rubbed it down to make sure it stuck, peeled off the transfer tape, and it worked perfectly! Even those little periods transferred. Brilliant. If you want, you could add a gift card, pencils, or other little present under the clip — whatever you think your kid’s teacher could use the most. Hope you’ve enjoyed this edition of Craft Lightning! If you enjoyed this post, I encourage you to pin it for later! What a wonderful idea – love it! I’m visiting from Turn It Up Tuesdays & now I’m your newest facebook follower. Great idea! I think my chemistry-major daughter would love this too. This is adorable! My husband is a high school science teacher and would LOVE this. You lost me a little with the vinyl, but I pinned it anyway because I might have to attempt it for him. Thanks for sharing! Hi there! Visiting from Hit Me With Your Best Shot. This is a super cute idea! Thanks so much for sharing! I love chalk paint and this is so cute!!! One of my best friends is a chemistry teacher, she would love this!!! Such a great idea I am sure any teacher would love. Thanks for sharing with us at Home Matters linky party. We hope you join us again. This is so cute and creative! I love it. I can’t wait to see what you do for your babies’ nursery.